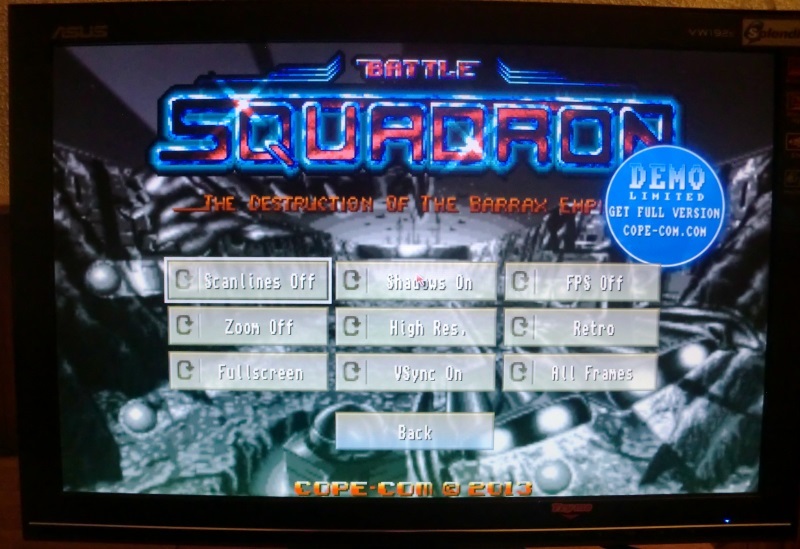 The first game I’d like to write about is Battle Squadron, a real Amiga classic from 1989. 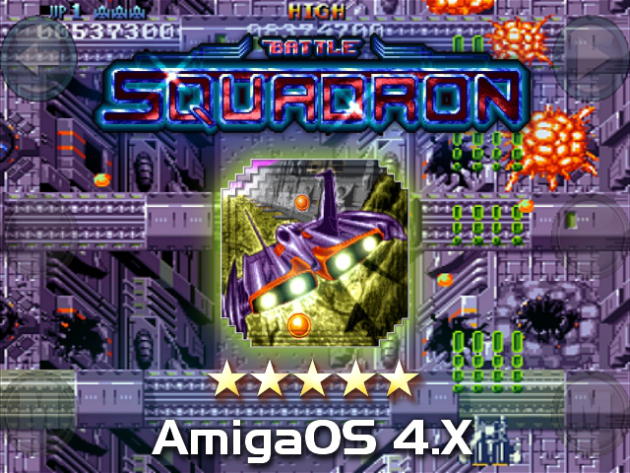 It is, however, not the old game I’m going to talk about, but the new version that were released for AmigaOS 4 in 2013/2014. I was initially going to purchase this one when it came out, but it never happened. I will now though, that’s for sure, after having had a go at the demo version again. Your mission code C61-178DE is to rescue Commander Berry D. Mayers and Commander Lori Bergin and their starship. The E.D.F. inter-track scanner picked up signatures from a huge Barrax alien enemy object moving towards the hollow planet Terrainia. Data indicates that the hollow Planet Terrainia is their home-base and is much feared due to cloaked enemy ships and the deep unfriendly subterranean worlds with frightening alien species. 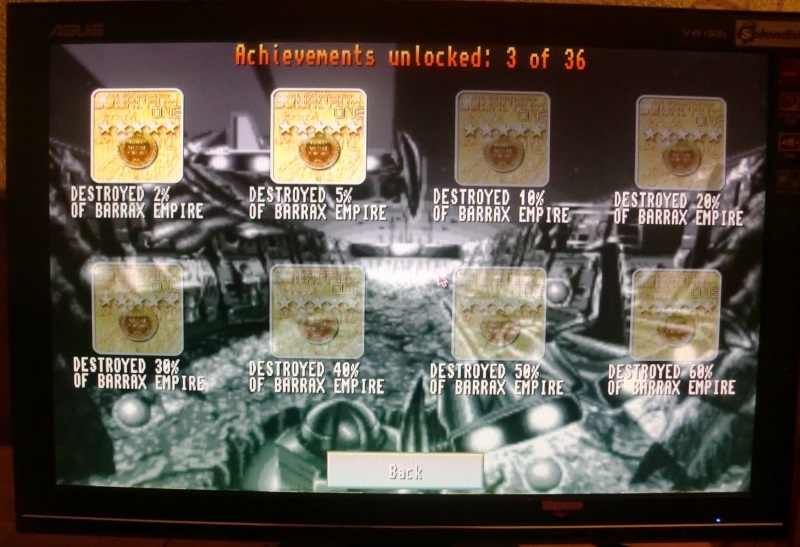 I tested the game on my SAM 440 running AmigaOS 4.1 Update 6. Installation was a matter of unpacking a LHA archive, which I let Dopus handle for me. The game itself loaded quickly and without any problems. Before it started a wide selection of screen-modes was available and I selected a common one. The game supports both one and two player modes. If you like to play with a partner you can both be on the screen simultaneously. The latter option is my favorite, since playing with a partner doubles the fun. Visiting Options will give you many possibilities of changing various aspects of the game and the game-play. If you are not happy with the default controls, these can be changed to suit your needs. 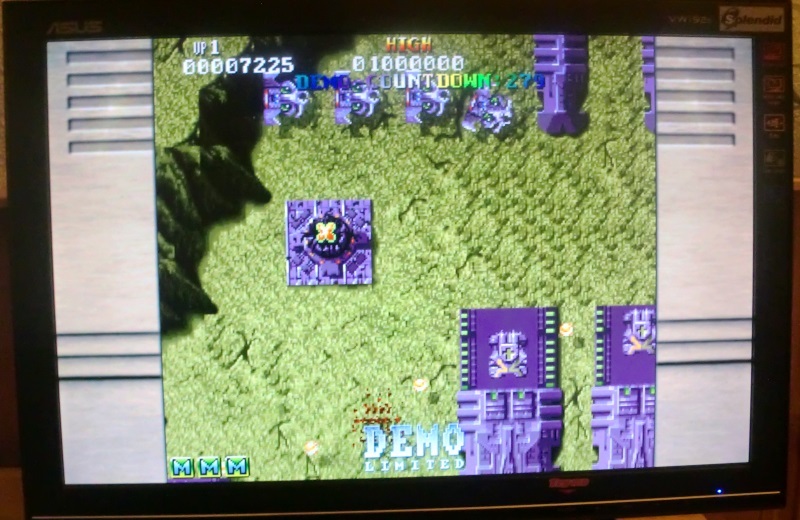 You can also play in full-screen or window-mode. Contrary to modern games it does not take 20-30 minutes of tutorials and/or watching cut-scenes to get started – you just select start and the action is on right away. This is something I cherish with older/retro styled games. If you just want to have a 10-15 minutes of action, you can do that with ease. I’m not talking mobile games (Android) here, but desktop ones. Once the game has started you are engaging enemies and blowing them to pieces, but beware, they are trying to destroy you too. The difficulty is OK and the game is easy to get into and later on master. On your way you’ll find plenty of bonuses to pick up. Be sure to grab them all! 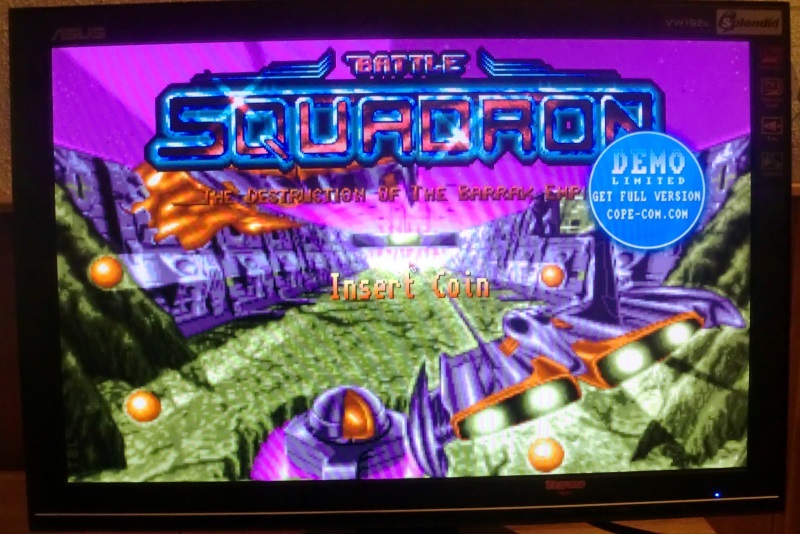 If you are interested in giving Battle Squadron a go, please head over to Cope-Com where you can find a free demo to try on your AmigaOS 4 setup! Thanks for reading my first post in the new series about gaming on AmigaOS 4. Stay tuned for more games and more posts in the future! Previous TekForce releases his first single from his album Tek Support! 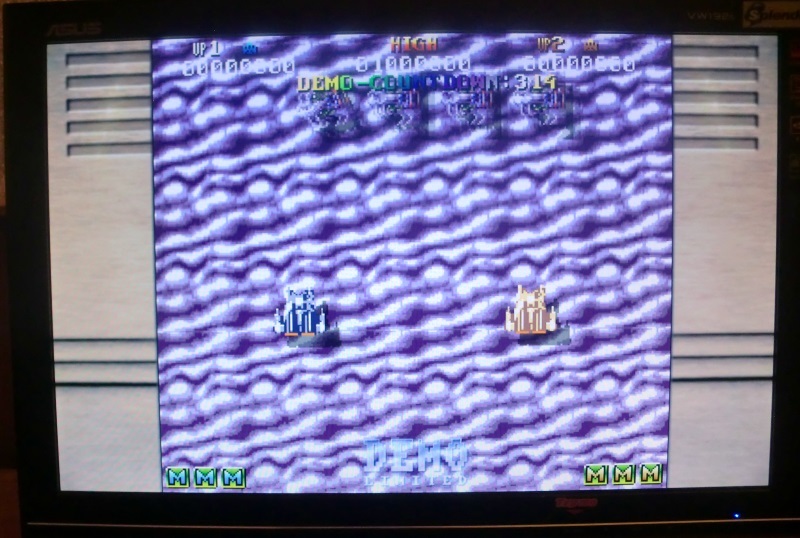 Reblogged this on Amiga Spiele News. Reblogged this on Gaming on AmigaOS 4. This is a very fun game but I had a hard time finding a copy to purchase.